I lost a close kin recently..
My beloved Grandfather,the late Mr NEO BOON CHUAN, after more than 1 year of battling with pulmonary fibrosis, gave in and rested eternally on 10th Oct 2007. It was a sunny and warm morning that morning. Flashback to 2 months ago, Grandad was in the same hospital, his complaints of breathlessness had the family worried enough to call for an ambulance. His usual doctor told us that it was more serious this time as his lungs had degraded to only 30% functionality. Grandad's lungs was slowing dying, cells not regenerating and just 3 months back, it was still 60%. Doctor Chan informed us that Grandad had less than 6 months to live. 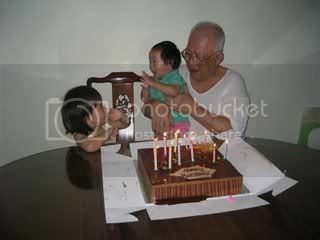 Just slightly a year before 10 Oct 2007, Grandad was already on Oxygen mask, even at home. 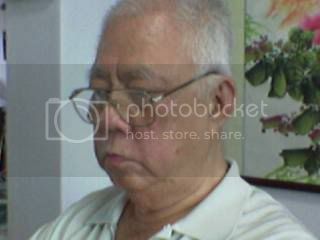 It was a bad bout of flu and lung infection he had caught while touring in China with his daughters and grandchildren. The oxygen tubes going into his nose meant it was difficult for him to move around. Even during those days, he made effort to come out into the living room to play Mahjong with us during weekends. Grandma would later tell us everytime he came out to join us for Mahjong sessions, the same night, he'd have respiratory problems due to overexertion. That always broke our heart when we heard that. During the last 2 months of his life, he didn't leave his room at all. The only place he was able to go was the attached bathroom in his room. Grandma, the maid and his daughters gave him the best care in the world. Us, his grandchildren came regularly even during weekdays to spend time and sometimes talk to him. However, during the last month, we hardly heard any words from him. My last memory of him during one of my afternoon visits was him calling my childhood name "Pang Kin" in his usual loud and low strong voice. That really made me so glad he still sounded so strong. But since then, it was mere sign language as he was too out of breath to talk. The night at the hospital before the Dormicium was injected, I sneaked out of home and drove to the hospital at 2am. Saw him and all the medical equipment around him. The maid was by his side. He was able to mumble some Bahasa Melaya to the maid asking her if she is hungry or tired. Afterwhich, those few words made him so out of breath, that he was only able to use sign language to ask me to go home and rest. He also gave me the thumbs up sign to tell me that everything was ok. The night the Dormicium was used, me and my sister Dominique and my brother-in-law, Sam was at the hospital almost throughout the night. Even in his uncounscious state, I could see Grandad struggling for each and every breath. And every breath he took, it seemed his last. It was at this time when I realised his light was dimming and it was anytime that the light will just go out. All the respiratory sensors showed a low heartrate and blood pressure. His hands were cold and clammy. We went home at about 4am. Last I saw, his breathing though struggling, seemed more constant then and it seemed like he was actually sleeping. At 7.30am, just as I woke up to get ready for work, I got the fateful call from my 3rd Aunt Alice. In her tearful voice, she told me to inform my dad that my Grandad had passed on and to tell him to go to the hospital immediately. In my heart, I was deeply saddened. This man, the pillar of our extended family, had passed on. When I reached the hospital, I saw him in his inanimated state. He no longer looked sick and feeble. He is no longer struggling to get his breath. On one hand, I felt relieved for him as he is no longer suffering. Yet on the other hand, I felt this immense pain of losing him forever. The days that followed were filled with things to do, traditions to follow and customs to practice. The wake, the prayers, the friends and relatives coming to pay respects, there were hardly any time to grief. And I am thankful for that. During the day of the funeral when Grandad's body had to be cremated, it was a hard moment for all. Tears and emotions choking in the throat and yet unable to shout or moan, because it will surely affect the others. It was in this light that I realised, the departed no longer feel any emotions. It is the living that have ties that cannot be separated by death. After the cremation, the whole family returned to the place of the wake for lunch at the void deck. It was a funny thing, the moment we alighted from the bus after we reached, it started to pour heavily. It was as if He wanted us to sit close together for lunch as rain was pouring in the void deck from the sides. Though in different tables, we all huddled closer to each other and savoured the lunch. In the last 2 months of Grandad's lifetime, we, his children and his children's children were able to make best of the remaining time and gave him the utmost care and attention. I am thankful we were given the chance to do that. The rest have to keep living.